The seventies was a troubled time for Harley-Davidson. The company had been purchased by American Machine and Foundry (AMF) who wanted to streamline production to reduce costs and increase profits. As tends to happen when the focus goes off making creative quality products and onto making money at all costs the quality of Harley-Davidson motorcycles dropped to the extent that people started nicknaming them “Hardly Ableson”, “Hardly Driveable,” and “Hogly Ferguson” which was to indicate that the bikes were more like a farm tractor than a motorcycle. Lots of people migrated away from Harley-Davidson to the products from the Land of the Rising Sun. 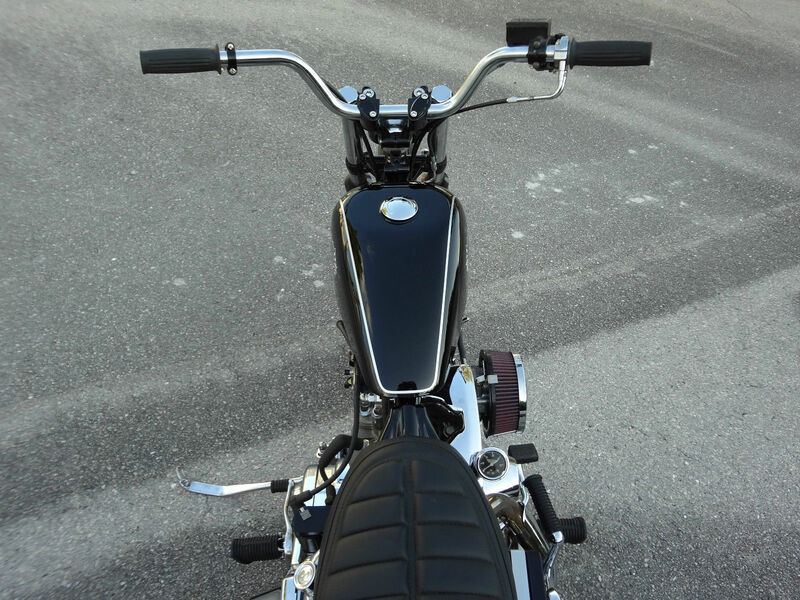 Although the seventies AMF era was not good for Harley-Davidson this custom 1978 bike has been completely re-built. Although the Harley-Davidsons of the Hippie era did not have a good reputation generally they make great custom motorcycles however. When you get a factory bike of mediocre quality and completely strip it down and custom re-build it you get something far better than the factory could have produced even at the height of quality production. You get a hand made work of engineering art. Nope, no speedometer. This is a minimalist bike which is what makes it so attractive. 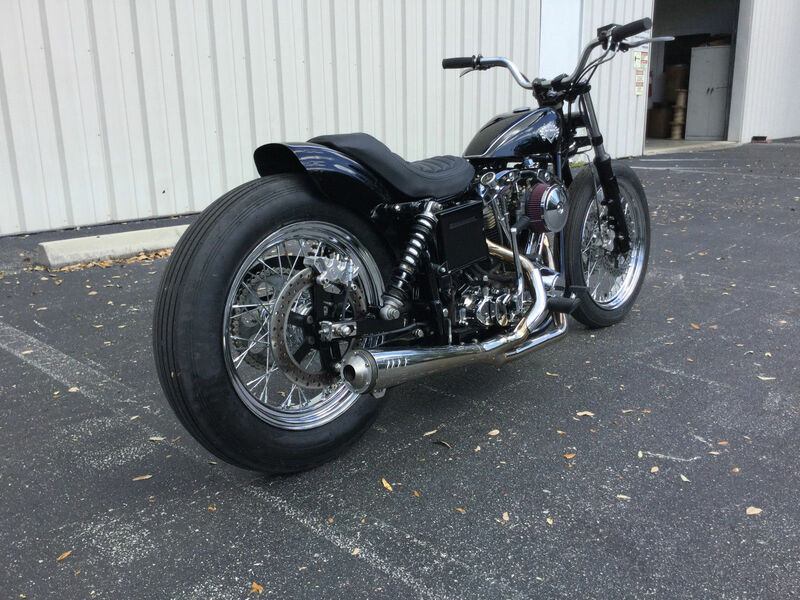 The 1978 Harley-Davidson custom “Bobber” in our photographs is a fully custom bike from Tamiami Tyrants Custom Cycles and at time of publication it is up for sale on eBay with four days left on the sale. The bike has an 88 cu. in. 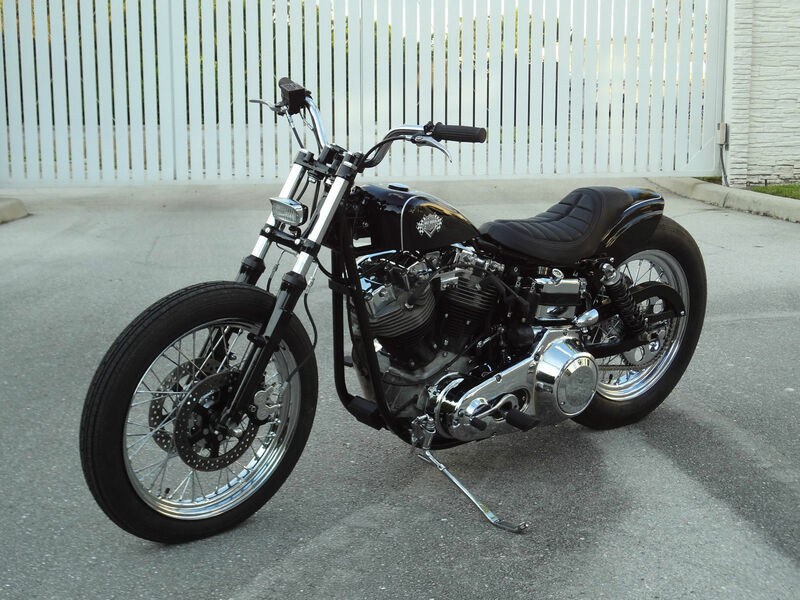 FXS Shovelhead engine custom built by Zippers Performance and breathes through a Super E Carb. 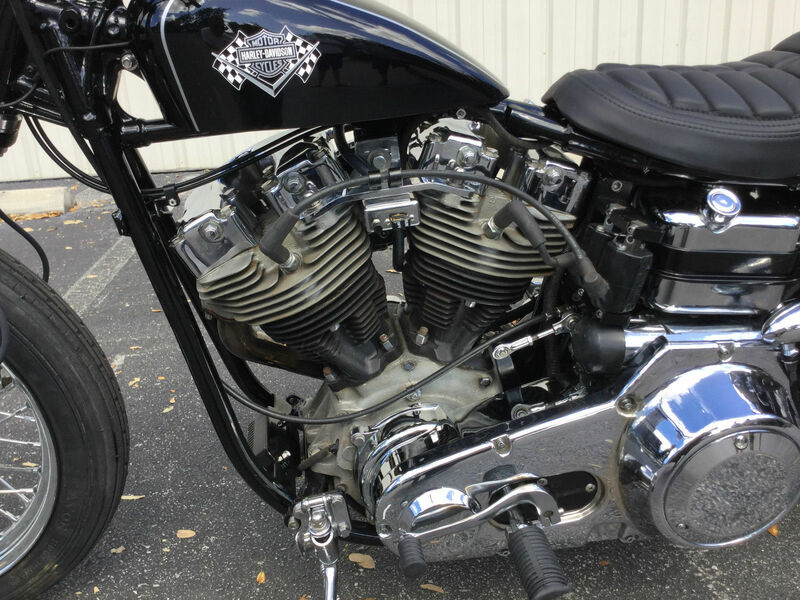 The Shovelhead FXS engine has been fully rebuilt by Zippers Performance. The clutch on this bike is a high performance Bandit Sportsman driving through a transmission that has been re-built using Andrews gears. The engine, clutch and transmission combination will allow the bike to spin the rear wheel without the need to rev it up and drop the clutch. Suffice to say the bike has an elegant sufficiency of power and torque that should provide hours of enjoyment whenever the bike is ridden. The bike also sounds gorgeous as you will hear in the video below. Stopping this adequately powered bike is accomplished with aplomb with dual four piston Performance Machine brake calipers up front and rear paired with all stainless brake lines. Tires are also new. The fuel tank and fenders are custom hand made and painted including custom hand made decals. The rest of the bike is powder coated. The fuel tank has also been professionally lined to ensure the fuel stays in the tank until it is sent to the combustion chambers. Tires are new and are proportional to the power capabilities of the bike. The seat on this bike is custom built and hand stitched leather. 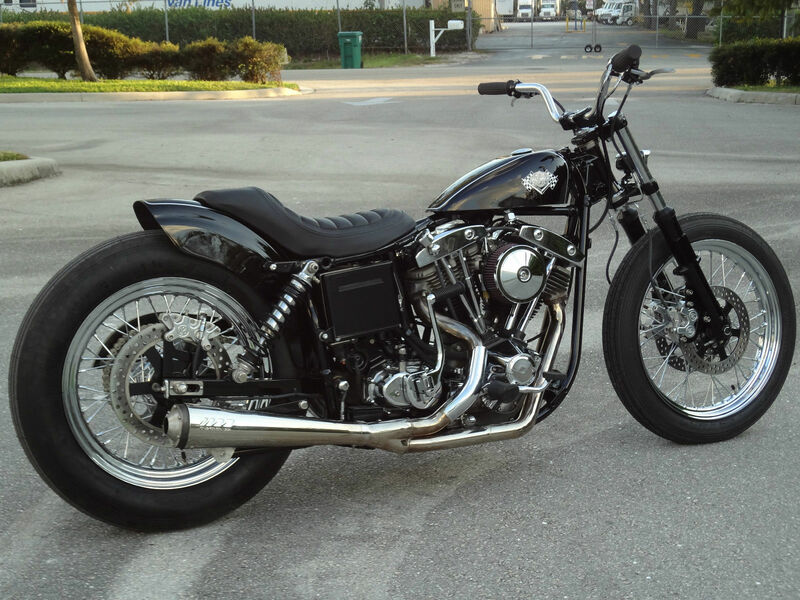 This bike is for sale by Tamiami Tyrants and you will find the sale page for it if you click here. This custom bike looks to be a lot more than a head turner. Its no nonsense stripped down styling makes it practical and comfortable. 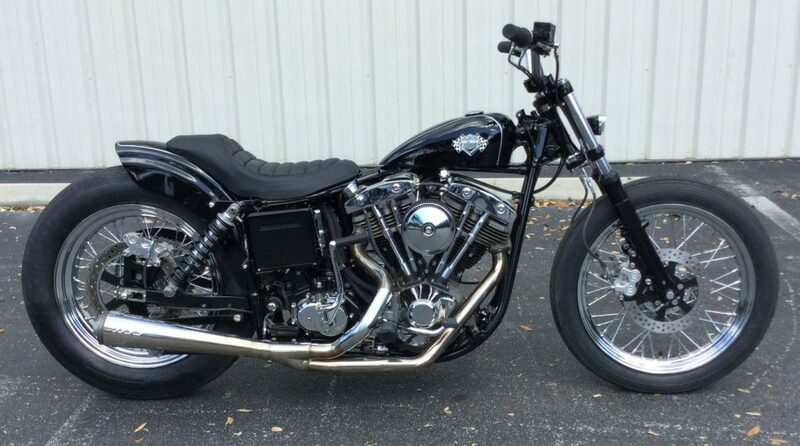 I think its the Harley-Davidson you have if you think you might like a Brough Superior or a Vincent Black Shadow. An all American bike to beat the Brits. (All pictures and video courtesy Tamiami Tyrants and eBay).